04.03.13 Family Easter and Computer Sale! Easter is over and Spring is here! We shared a wonderful family day at our empty house the Saturday before Easter with our son Chip’s family and my sister Harriett’s family. They are all genuinely kind and caring people and I cherish each time we’re able to get together. We had plenty of food to go with our traditional meat – Popeye’s Chicken! Madisyn spent last Friday with me decorating (with the things my coworkers gave me so the house wouldn’t be totally empty and have a somewhat festive spirit about it!) and cooking. We had a wonderful time together. 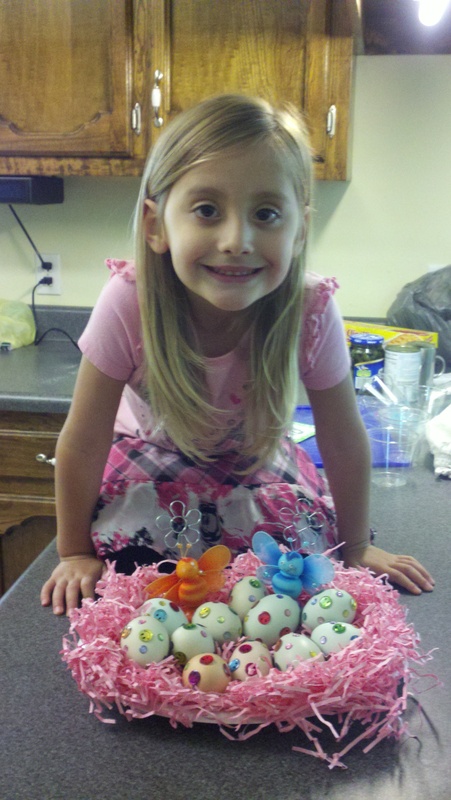 One of the things we did was decorate eggs. They were yard eggs that our friend Elizabeth gave us and were naturally green, blue, pink and light brown. So no need to dip them to get them colored. We put little pastel rhinestones and smiley face rhinestones on them and not only did we have a great time doing it but they came out precious! 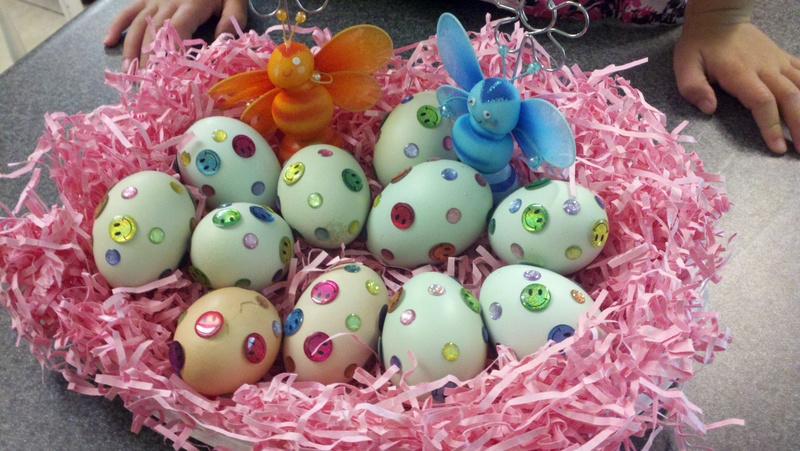 A first for me to have pretty Easter eggs! 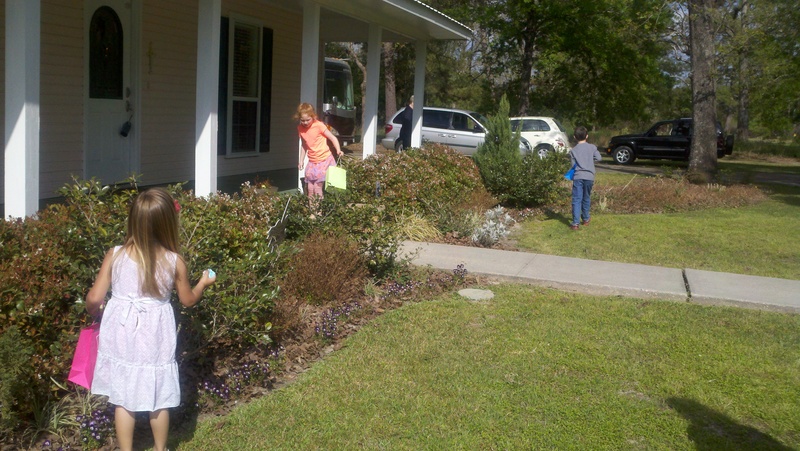 The youngest children, Madisyn, John and Sally enjoyed the Easter egg hunt. My sister came up with the idea of having 12 eggs per child (six of one color and six of another color). Each child was assigned two colors and were instructed to hunt for their colors. 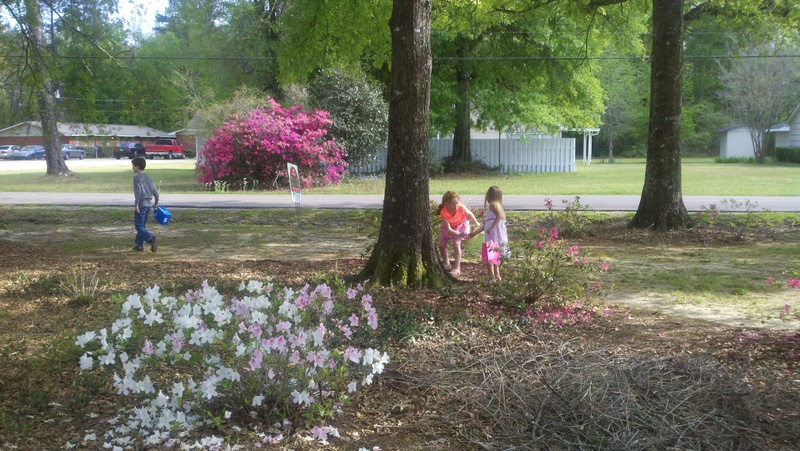 It was a wonderful way to cut down on the everyone for themselves that egg hunts turn into. They were helping each other by telling the person with a blue egg that they found one instead of scooping up the egg and keeping it. Everyone got the same number of eggs and they were all happy! 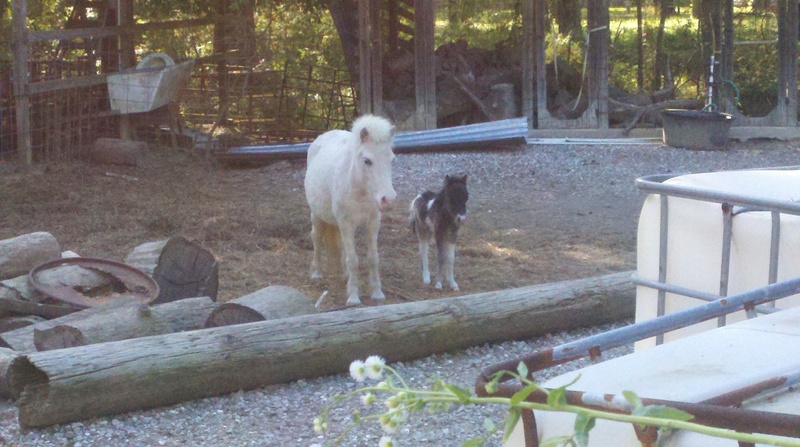 I included some pictures of the hunt and of our visit to our next door neighbor’s house where her white miniature horse had just given birth two days before to a little horse. The children enjoyed seeing that and the other miniature ponies in the coral. Someone said the other day that we live in the country. I don’t see it that way at all since we’re close to the big city of Hammond. However when I think about the fact that we live next to property with ducks, chickens, a donkey and horses I guess we are in the country! This Saturday is the long awaited Computer sale. Probably no one’s been long awaiting it but us though! Tables in the garage are all laid out with computer parts, cables, keyboards, mice, 10 computers with monitors and keyboards, desks, bookcase and a table with chairs for sale. There are even around 150 tire stem valves. Perhaps everyone has this many but since I seriously doubt that. It’s just another one of Roy’s purchases where he couldn’t resist getting an over abundance just in case they are needed. I’m thinking that if we didn’t sell them we would be passing down tire stem valves to our great, great grandchildren and still would never run out. A few household items and tools round out what’s for sale and I can’t wait for this last sale to be behind us! Not that we’re going anywhere yet, but we could at the drop of a hat when all the selling is over. Ya’ll come back now ya’ hear!! < 03.21.13 Spring has sprung, house for sale OR RENT, He is Risen! !